The Mission Statement of the Coopertown Police Department is the protection of life and property, the preservation of public peace and community oriented enforcement of the laws to accomplish our mission we dedicate ourselves to service and concern. 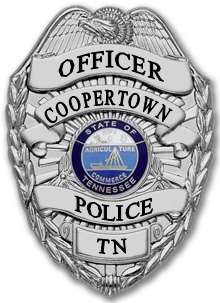 The Coopertown Police Department and all of its employees are dedicated to providing services to the citizens of Coopertown and Robertson County in effective efficient, and morally-sound law enforcement practices and procedures. If you need an officer's assistance and it is NOT an emergency, please call Robertson County Central Dispatch at (615) 384-4911. Office Hours: Monday - Thursday 7:30 a.m. - 5:00 p.m. and Friday 8:00 a.m. - 3:00 p.m. Phone: 615-382-7007 ext. 212 for accident and other report requests, questions regarding citations, court, and other general information. Coopertown Police Department thanks Ruby Cash for donating a 32-inch flat screen television to the department for training purposes and viewing security tapes used in solving crime. This gift will benefit every member of the Police Department as well as every member of the community.